Following are some of the key reactions to Tuesday night's huge defeat for British Prime Minister Theresa May. "If a deal is impossible, and no one wants no deal, then who will finally have the courage to say what the only positive solution is?" -- EU Council president Donald Tusk, who added the remaining EU27 "will remain united". "It's now up to the British government to say what the next stage is. The EU will remain united and determined to find a deal." -- The EU's chief Brexit negotiator Michel Barnier. "This is a bitter day for Europe. We are well prepared -- but a hard Brexit would be the least attractive choice, for the EU and GB (Great Britain)." -- German Finance Minister and Vice Chancellor Olaf Scholz. "A hard Brexit will be the worst of all options." -- Annegret Kramp-Karrenbauer, leader of Chancellor Angela Merkel's centre-right CDU party and her likely successor. Foreign Minister Heiko Maas said delaying Brexit beyond March 29 would make no sense. "It would only make sense if there is a path to the goal of a deal between the EU and Great Britain." "Either way, we will have to negotiate a transition period with them because the British cannot afford to no longer have planes taking off or landing at home, and their supermarkets, as much as 70 percent, are supplied by continental Europe." -- President Emmanuel Macron. "Second option, they tell us... 'We'll try to improve what we can get from the Europeans and then hold the vote again. "In that case, we'll look into it. Maybe we'll make improvements on one or two things, but I don't really think so because we've reached the maximum of what we could do with the deal." 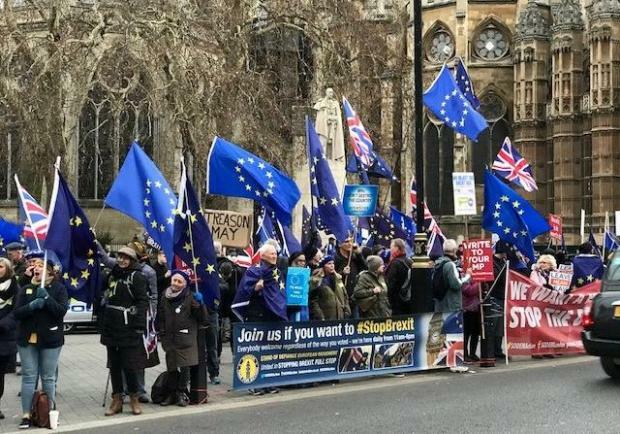 France's Europe Minister Nathalie Loiseau said the EU could push back the March 29 deadline if London made such a request. "Legally, technically, it's possible." - "Regrettably, the outcome of tonight's vote increases the risk of a disorderly Brexit. Consequently, the government will continue to intensify preparations for such an outcome." -- Government statement. "In any case, there will be no renegotiations on the withdrawal agreement." -- Austrian Chancellor Sebastian Kurz, in a tweet. "Preparations for all scenarios will continue and be intensified, including the inauspicious scenario of a withdrawal without a deal on March 29." - Italian Prime Minister Giuseppe Conte. "An unordered exit would be negative for the EU and catastrophic for the UK." -- Spanish Prime Minister Pedro Sanchez.